A fever, also referred to as pyrexia, is an elevation in the body temperature above the norm. This is broadly defined as oral temperature reading above 37.5 degrees Celsius (99 degrees Farenheit) and a core body temperature (rectally) above 38 degrees Celsius (100.4 degrees Farenheit). Variations in temperature may occur depending on where the measurement is taken (oral, rectal, axilla). A fever should not be diagnosed by touching and estimating the skin temperature or the feeling of being ‘feverish’. The body temperature varies by a maximum of 0.6 degrees Celsius (adults) and 0.5 degrees Celsius (children) in the course of a day – the lowest temperatures are usually recorded in the morning and the highest by late afternoon. The axillary temperature (taken under the arms/armpits) is the least accurate while the temperature taken rectally (core body temperature) is the most accurate. In older patients, an temperature taken orally is unreliable. A wide range of causes, particularly infections, can trigger a fever. Substances that causes a fever is known as pyrogens. The body maintains the normal body temperature (set point) between 36.5 to 37.5 degrees Celsius (97.7 to 99.5 degrees Farenheit) which is monitored and maintained by the thermoregulatory center in the hypothalamus. As a response to certain circumstances, the body raises this set point and a host of changes occur in the body to initiate what is termed as a fever. Blood is forced from the periphery due to vasoconstriction because this is where the a lot of heat is lost into the environment. At the same time, shivering may begin – the rapid muscle contractions causes heat generation as a result of increased metabolic activity. Since a person feels cold during this time, they may also take measures to conserve heat by covering themselves with heavy clothing or a blanket. All of these measures serve to conserve heat, generate more heat and increase the heat around the head and torso (core body temperature). These processes continue until the blood flowing past the hypothalamus matches the new raised set point. A temporary rise in the body temperature is not considered abnormal – hormonal changes, emotions, activity and environmental factors can affect the body temperature to a slight degree. The normal body temperature is accepted to be around 37.5 degrees Celsius although the body may not always be recorded at such a ‘perfect’ reading. The lowest but normal levels (usually in the morning) may be as low as 36.5 degrees Celsius. The highest but still normal level (usually by late afternoon) may be as high as 37.8 degrees Celsius although a temperature as high as 38 degrees Celsius may be considered acceptable due to errors in thermometer readings and individual variations. A temperature above 37.7 degrees Celsius/99.9 degrees Farenheit (orally) or 38.2 degrees/100.7 (rectally) is considered as a fever in adults. For children, a body temperature above 38 degrees Celsius/100.4 Farenheit (rectally) is considered as a fever. A high fever is considered as a body temperature equal to and above 40 degrees Celsius/104 degrees Farenheit. This should be considered as a medical emergency if the fever does not respond to (“break”) with the use of any medication. 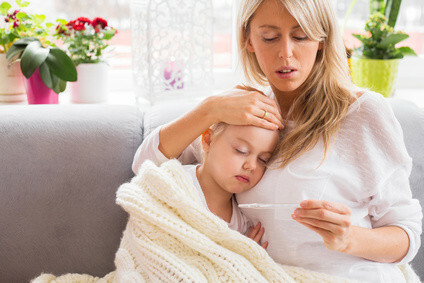 In infants younger than 8 weeks, a body temperature greater than 38.3 degree Celsius/101 degrees Farenheit should be considered as a high fever and requires prompt immediate medical attention. The onset of a fever may at times be the first indication of an illness. It is difficult to to ascertain the exact cause of a fever without the presence of other signs and symptoms and in acute cases, a fever is most likely due to an infection. In a healthy adult, a mild fever may be transient and the body is able to cope without any risk to the health of a person. However, high fevers (above 40 degrees Celsius/104 degrees Farenheit) or a persistent fever may be an indication of more serious underlying causes that need to be isolated and treated as soon as possible. Typically localized symptoms are evident – pain, changes in normal functioning, discharge or swelling. However, the lack of signs and symptoms should not mean that the fever can be ignored, especially if the body temperature continues to rise or if the fever is persisting. The signs and symptoms of more serious causes, like sepsis, can be vague except for the presence of a high fever and is life-threatening without prompt medical attention. Bacteria and viruses are the most common infectious causes of a fever. Fungal and protozoal infections are less common causes but should not be ignored, especially for travelers who recently visited endemic areas. Common conditions : acute sinusitis, pharyngitis (strep throat, tonsillitis). Discharge – runny nose, nasal congestion (sneezing), phlegm (coughing). The presence of pus may be indicative of a bacterial infection. Common conditions : bronchitis, pneumonia, lung abscess, empyema. Common conditions : gastroenteritis – bacterial and viral. Common conditions : bacterial urinary tract infections (UTIs). Common conditions : abscess, cellulitis, insect bites/stings. Patients who have been recently hospitalized or visited a health care facility should always be aware of nosocomial infections (hospital-acquired infections), post-operative infections, drugs and reactions to transfusions as a possible cause of a sudden fever. Other risks in hospital include IV catheters and ventilators (pneumonia). Vector exposure should always be considered even if no visible bites/stings are evident. Many animals and insects are carriers of a number of infections. Refer to the article on Drug Fever for a complete list of substances responsible for drug-induced fever and drug-induced hyperthermia. There are various other causes of a fever in adults, some of which may not cause a fever of sudden onset. These conditions are usually chronic in nature and include autoimmune diseases, malignant tumors and chronic infections in immunocompromised patients (like in HIV/AIDS). A chronic fever is a term commonly used to describe a fever of unknown origin (FUO) although it can be used to describe a fever that is persistent or episodic despite not meeting with the criteria for FUO. It is not uncommon for an acute fever to last for more than 4 days in severe infections but usually does not persist past 7 days. A chronic fever may not always be persistent and is often intermittent with short episodes of a few hours/days of elevated body temperature spread over a long period of time, usually weeks or months or even years. This may also be related to periodic fever syndrome where the fever is usually accompanied by clinical features associated with inflammation like abdominal pain, joint pain and swelling. Periodic fever syndromes are not associated with an infection and are therefore not contagious but are often due to genetic factors as with Family Mediterranean Fever. Alternatively, the fever may be non-specific with no associated signs and symptoms. Read more on continuous fever. The term acute and chronic refer to the duration of the fever, while the term persistent usually refers to the nature of the fever. A persistent fever is one that is ongoing (continuous) and may or may not respond to anti-pyretic medication and may or may not settle although the suspected cause is resolving. A persistent fever may be acute or chronic. As with any fever, a chronic fever may be low-grade, mild/moderate or high. A low-grade fever is an elevation in the body temperature above the norm but is usually below 38.3 C/101 F.
A mild/moderate fever or common fever is a body temperature above 38.3 C/101 F but less than 40 C/104 F.
A body temperature equal to or above 40 C/104 F is considered as high with temperatures exceeding 41 C /106 F referred to as very high/extreme fever. In most cases, a chronic fever is either low-grade or mild. There are many causes of a chronic fever, including infections, neoplasms, rheumatological causes and other unknown causes. If a chronic fever meets with certain criteria as listed below then it is diagnosed as a fever of unknown origin (FUO).